Have you considered e-Giving for your church? With the rise of electronic payments, fewer people are writing checks. In the U.S. over 58% of adults own a smart phone device and spend over 5 hours a day online. Offering members e-Giving options meets them online where they can conveniently schedule donations in the same way they pay other obligations. 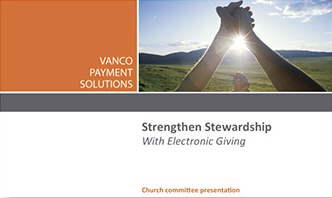 If your church is considering the addition of electronic giving, we encourage you to download this presentation provided by Vanco Payment Solutions, our e-Giving integration partner.